I pulled out my plain black t-shirt the other day and decided it needed some kind of pizazz. So, since I’ve had my sewing machine out from making costumes, I thought I’d have some fun with pretty scraps of fabric and some free motion sewing. 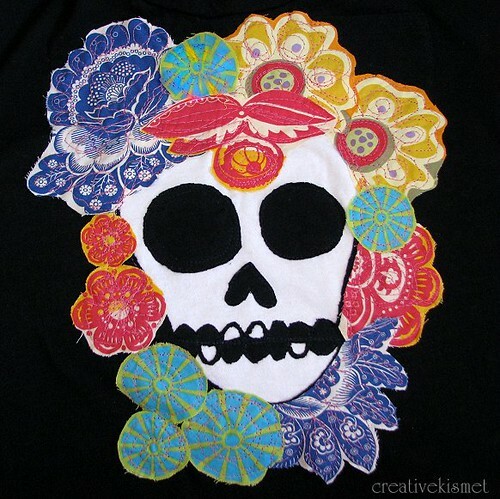 First thing that came to my head was a sugar skull, which is what’s in my mind this time of the year. I’ve been seeing so many fun DOTD things over on Pinterest that I couldn’t help myself. 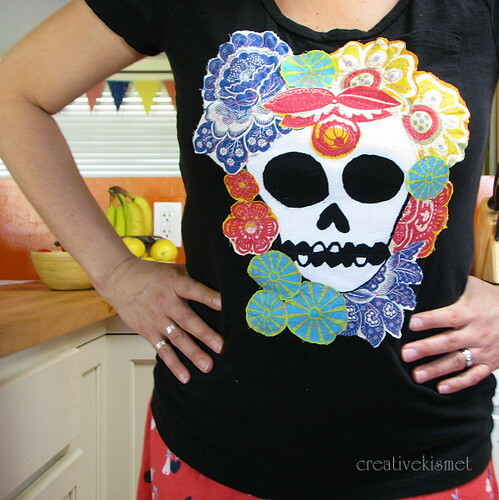 Check out this pretty face, awesome painting, this sugar skull cookie (YUM! ), fun skull eggs, pretty hair thingy, this bead and cool filigree skull. This entry was posted in i make stuff, Sewing, Spooky. Bookmark the permalink. Your t-shirt turned out great ~ love how the colors stand out on the black. Very cool…I really like this! I really, really love this shirt!!!! oh I just love this Regina! so creative and original! !